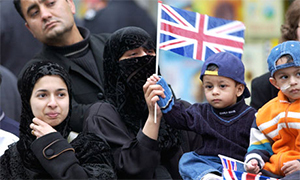 An article in Birmingham Post by Waqar Ahmad Ahmedi who explains why Muslims can pledge allegiance to nation and faith. The alleged plot to kidnap and torture a Muslim soldier in Birmingham revived a heated debate about citizenship, loyalty and Islam. The Birmingham raids also raised the issue of the possible impact these events would have on British Muslims considering a career in the military, as the Armed Forces remain occupied in Afghani­stan and Iraq. The question arises, then, how Muslims can balance both commitments, particularly when their own country is at war with fellow believers? Although Muslims can question the state’s policies, they are duty bound to co-operate. Disagreement is one thing, disobedience quite another. Present day Clerics, esteemed as learned and rightly guided and motivated by a sheer hatred for the West, deliver fiery sermons about jihad that attract youth willing to die for their cause with a desire to become martyrs. The fanatics are every ready to shed innocent blood, but seem reluctant to wage the war the Holy Prophet, may peace and blessings of Allah be upon him, himself deemed the greatest and most commendable – the jihad against oneself. Self-purification is the constant striving of every believer, regardless of the climate being harmonious or hostile. Even in the latter case, where injustices are committed against Muslims, the Holy Qur’an counsels peace, patience and prayer. Retaliation is only permitted as a last resort. For the first 13 years of his ministry, the Holy Prophet, may peace and blessings of Allah be upon him, was a persecuted citizen in his own city. His call for monotheism and equality among a vicious, idolatrous people was not only ridiculed, but resulted in physical torture for anyone that joined him. However, as his message found increasing sympathy and appeal, not only did the tyrants of Mecca deny the Muslims the right to worship and dispossess them of their properties – forcing a mass migration to Medina – they launched a dedicated campaign to terminate the new faith and its followers. Under such horrific conditions Islam was entitled to self-defence. Whether it is in the Armed Forces or other fields, Muslims have a responsibility to make a positive contribution to this country. Not only will this enable Muslims to fulfil their duties as citizens, it should help to promote a greater appreciation of Islam among the indigenous population. For Muslims, assimilation should come naturally, not least because the celebration of diversity was originated by Islam itself. When the Holy Prophet, may peace and blessings of Allah be upon him, won the hearts and minds of Arabia, he created a single and unified, but ideologically diverse, state that removed local tribal prejudices and ensured a healthy integration of rich and poor, black and white, people of different languages and dialects, those belonging to various cultures and indeed faiths. The message to fellow British Muslims is simple: be faithful to a Government that ensures religious freedom and tolerance. The peace of any civilised nation depends on upholding these precious values. And the sooner the militants change and step into line, the better. Next Topic Is Suicide Allowed in Islam?